also found that the scanner performed very well in our office. Great service and the best price I could find on the net! I ordered it at 4pm and it arrived the next day!! We have been pleased with the product , simple to use and no issues with training or health and safety. One issue where it does not switch itself off and will continue to shred whilst there is no paper in it, but this is manually turned off and sorted. Does what it says on the tin. although a bit noisy in a quiet office environment and the bag it comes with is a bit flimsy. We have adapted a cardboard box to fit in, instead. Very sturdy and efficient shredder. Just what we need in our busy office. Jam Free, Hassle Free, Mess Free! 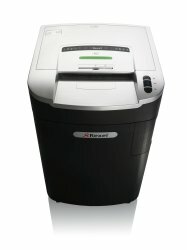 Designed for the busy office with over 20 users, this Mercury shredder provides sufficient security to shred confidential documents into approx. 400 4x40mm cross cut pieces. It features Jam-Free technology with continuous sensing, takes 20 sheets at a time and fits up to 1,100 shredded sheets in 115L recyclable bags enclosed in a pull-out frame for easy emptying. Cross cut P-4 security level.